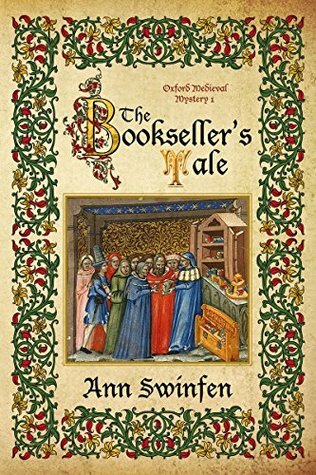 The Bookseller's Tale is the first in a series of mysteries set in 14th-century Oxford. The book takes place a few years after the population has been decimated by the Black Death, the effects of which are still widely felt. Nicholas Elyot, the main character, is a bookseller who lost his wife to the plague. One day he finds the body of a student in the River Cherwell, and discovers that his death was not due to natural causes. The town authorities don't seem to have any interest in investigating the murder, but Nicholas and his friend Jordain Brinkylsworth, a member of the university, feel they owe it to the victim to find out. One of the big things I liked about this book was the historical detail - we find out quite a bit about medieval Oxford, the university, and particularly about Nicholas' work as a bookseller, which I found really interesting. Some readers might not enjoy these details as they mean there is a little less focus on the mystery, but I think they seemed to fit naturally into the story. I also enjoyed the scenes of domestic life, and how the effects of the Black Death were explored; for example, the characters feel that since "the Death", people are more immune to suffering and thus less willing to help others. I'm not sure whether this would have been the case but it's not something I'd thought about before, so it's interesting to consider. As for the mystery, I thought it was good. Perhaps not surprisingly, books play a significant role, and it was one of those mysteries where there are various clues which don't make sense and have to be pieced together. There were a few twists along the way, which I didn't see coming (though perhaps others might). The one thing I thought could have been improved on the characterisation. The main characters were all likeable enough, but they seemed a bit flat and forgettable; none of them exactly leapt off the page. Still, there were enough interesting things about this to keep me reading, and I'm hoping the characters might develop more in later books. All in all, I thought this was a good read, and I'm looking forward to continuing with the series. (There are four books at present, and hopefully more to come.) I might also check out some of the author's other books, as most of them also sound interesting. If you enjoy mysteries, and/or have an interest in history or the Middle Ages, then I'd definitely suggest checking this out. At time of posting, this is currently discounted to 99p/$1.29 on Kindle.